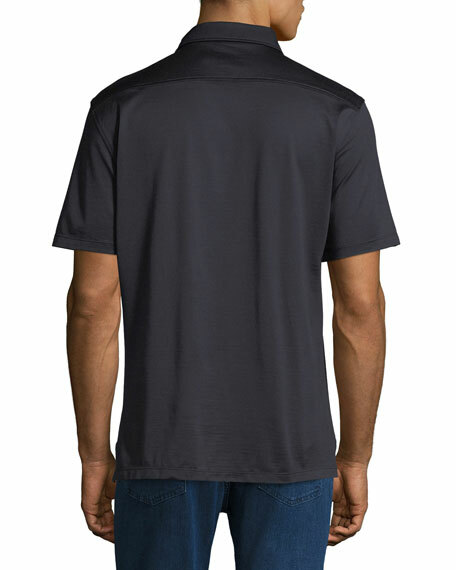 Ermenegildo Zegna polo shirt in solid jersey. For in-store inquiries, use sku #2502643. Berluti polo shirt with calf leather trim. Spread collar; three-button placket. Short sleeves; ribbed cuffs. Pullover style. Vented hem. Cotton/silk mulberry. Made in Italy. Model's measurements: Height 6'1"/185cm, waist 32"/81cm, typically wears size M.
Culturata polo shirt in luxurious, breathable, soft-touch Italian fabric. Spread collar; three-button placket. Long sleeves. Straight hem. Pullover style. Virgin wool. Made in Italy. Model's measurements: Height 6'1"/185cm, waist 32"/81cm, typically wears size M.
Ermenegildo Zegna polo shirt. Point collar; three-button placket. Rounded barrel cuffs. Straight hem. Cotton/wool. Imported. Model's measurements: Height, 6'2"/188cm, Suit 40L, Shirt 14.5x35, Waist 32"/81cm, Inseam 33"/84cm. 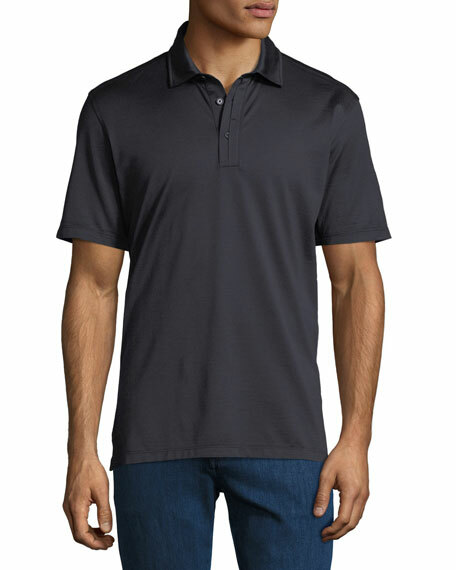 Michael Kors polo shirt with engineered birdseye stripes. Crocheted spread collar and cuffs. Three-button placket with contrast facing. Short sleeves. Michael Kors polo shirt with engineered birdseye stripes. Crocheted spread collar and cuffs. Three-button placket with contrast facing. Short sleeves. Pullover style. Regular fit. Pima cotton. Imported. Model's measurements: Height 6'1"/185cm, waist 32"/81cm, typically wears size M.